Eating healthy isn't that hard if you have healthy food to eat and you know that that healthy food tastes good. I'll be honest; I'd sometimes rather eat (unhealthy) food at a restaurant than take the time to cook something (slightly more healthy) at home. 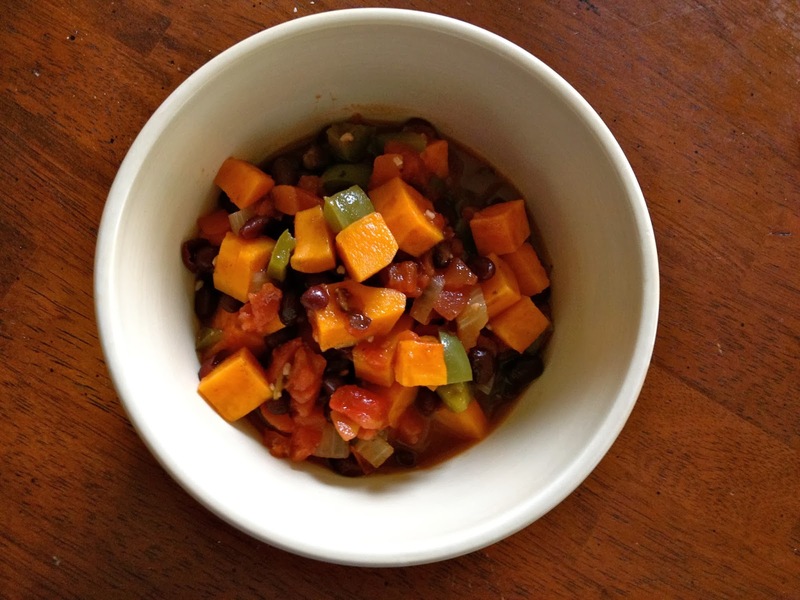 But every once in a while I'll find a recipe that is easy and healthy and delicious. This is one of those recipes. Usually chili takes hours to make. Though most of that time is just simmering on the stove to develop all the flavors, it's still a pretty big time commitment. That's one of the reasons this recipe is so great: it will be ready to eat in under an hour and it tastes just fine. All you have to do is dice some vegetables, add some spices, and cook everything together for half an hour or so. It's savory and spicy, and it is full of all sorts of vegetables. If you use vegetable broth instead of chicken broth, it's even vegetarian/vegan! The chili is hearty enough that you won't miss the meat, but you can always stir in some ground turkey if you want some lean protein, though the sweet potatoes and beans are already filling. It's definitely going to help you stick with your resolution! Heat some oil in a large pot. Add the sweet potatoes, onion, and bell pepper and cook until the onion is soft, about 5 minutes. Stir in the garlic, jalapeño, chili powder, oregano, and cayenne; cook until the garlic and jalapeños soften, 1-2 minutes. Add the tomatoes, black beans, and broth. 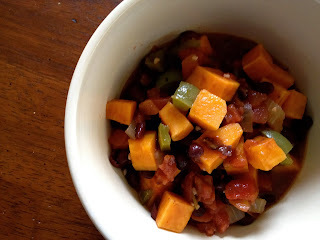 Simmer for 30-40 minutes or until the sweet potatoes are tender.